The International Ice Hockey Federation’s first international break is upon us this hockey season meaning several U.S. national teams will be in action this week both domestically and abroad. 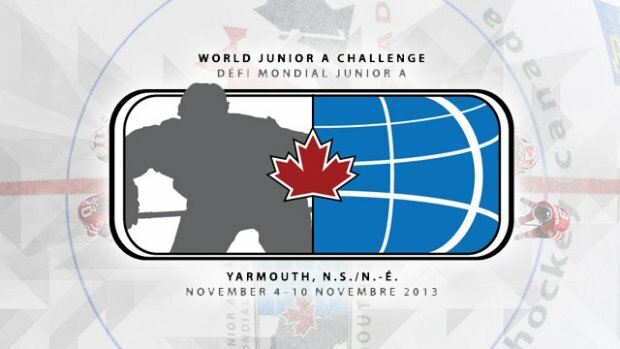 One of the bigger tournaments of the break is the 2013 World Junior A Challenge, hosted in Yarmouth, Nova Scotia, starting Tuesday. The tournament features the U.S., Russia, Switzerland, the Czech Republic and two Canadian regional teams — Canada West and Canada East. The tournament is designed for players under the age of 19. The U.S. Junior Select Team is made up of players entirely from the USHL (excluding players from the National Team Development Program), while Canada’s squads are made up of players from the various Junior A leagues across the country. Team USA’s complete roster is here. The U.S. has won this event four of the last five years, going on a streak from 2008-10 and reclaiming the title last year. Team USA opens tournament play Tuesday against Russia. Coming up after the jump, Team USA’s full schedule, how to follow the tournament and some of the American players to watch. The World Junior A Challenge is a great opportunity for all who participate to gain some valuable international experience. Playing in a short tournament against strong competition, especially with high expectations to win is helpful. This is also a solid opportunity for the many draft-eligible players on Team USA to showcase themselves outside of their normal environment and some higher stakes. The tournament will be carried in full by FASTHockey.com, and I believe the games will be free if you sign up for an account (at no cost) with the streaming service. So this is a pretty solid tournament if you want to tune and catch some future NCAA stars and probably several future NHLers as well. The tournament starts with two round-robin games that determine the seeding for the playoff round. After that, it’s single elimination, so the margin for error is pretty thin. Team USA is in Group A with Russia and Canada East, while Group B includes Canada West, the Czech Republic and Switzerland. The U.S. played a pre-tournament game Saturday against Canada West, earning a 4-3 victory. Kyle Connor scored twice in the exhibition, while Neal Pionk and Karson Kuhlman also tallied goals. Cal Petersen stopped four of five shots while splitting the net with Chris Birdsall who made 19 saves on 21 shots. Team USA should be heavily favored to win with a very strong lineup that includes a few NHL drafted players as well as a few more who could hear their names called within the first three rounds this season. There’s also a lot of international experience on the roster for Team USA, which should prove helpful this week. The U.S. Junior Select Team is led by Green Bay Gamblers head coach Derek Lalonde. He is joined on the bench by Youngstown Phantoms head coach Anthony Noreen and Sioux City Musketeers assistant Mark Abalan. College commitments in italics at the end of each capsule. 2014 NHL Draft eligible unless otherwise noted. There are a lot of good players on this U.S. squad, so this team should do pretty well at the World Junior A Challenge. With four titles in five years, the standard has been set, so there is some pressure to live up to that. — Maxim Tretiak is one of the goaltenders that will be joining Team Russia at the World Junior A Challenge. If that last name sounds familiar, it should. Maxim is the grandson of legendary Soviet goaltender Vladislav Tretiak, who also runs Russia’s hockey federation now. The 17-year-old netminder isn’t draft eligible until 2015, but he has been solid for CSKA’s junior club this year. The World Junior A Challenge is a solid tournament that gives a lot of players a good taste of what international hockey is all about. Last year’s U.S. team was awfully fun to watch and with the skill level this year, it should be more of the same. We’ll have a recap of the tournament upon its completion. Until then, USA Hockey will have post-game recaps and stats here. This entry was posted in American Prospects, Junior Hockey, NCAA, NHL Draft, U.S. National Teams, USA Hockey. Bookmark the permalink.